I think I've mentioned before that when it comes to starchy sides, couscous is usually my go-to. It's ready in mere minutes, adapts easily to a variety of flavors and preparations, and the results are delicious. 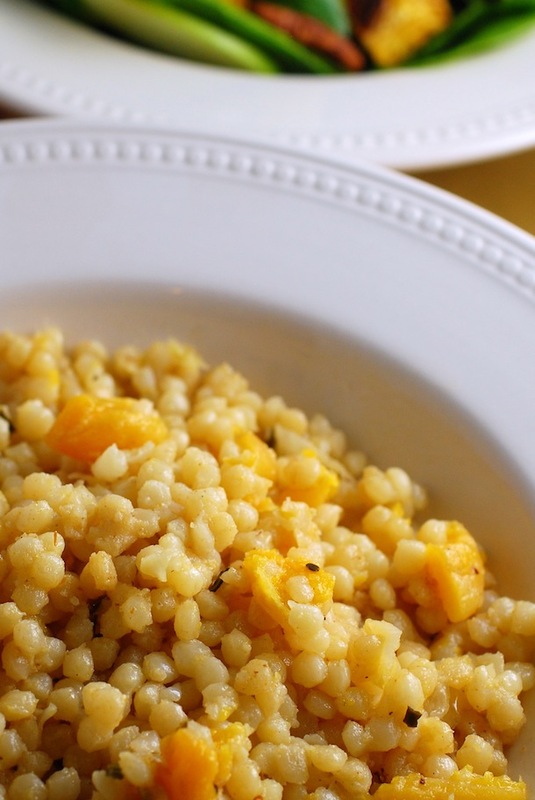 This version uses Israeli couscous (also known as pearled couscous), which has a larger bead than the classic Moroccan kind, and adds really great texture to a dish. I started by sauteeing diced onions in olive oil, and then cooked the couscous in a mixture of vegetable broth/water and coconut milk, which gave the little pearls a slightly sweet, fragrant flavor. I also added diced apricots to the mix, and they steamed and rehydrated to the point that one of my friends thought they were fresh apricots. This is a lovely and simple Fall side dish that would definitely be welcome on your holiday table! Place a large skillet with a fitted lid over medium-high heat. Add the butter or oil, and the onions, and saute 5 minutes until tender. Add the couscous and toss until coated in the oil. Add the coconut milk, broth, apricots, and 1 teaspoon salt. Stir to combine and bring to a gentle boil and let cook 4 minutes. Reduce heat and simmer for about 8 minutes, stirring occasionally, or until most of the liquid is absorbed. Remove from heat, cover, and let stand 5 minutes before serving.